Keridwen: a new generation IME. 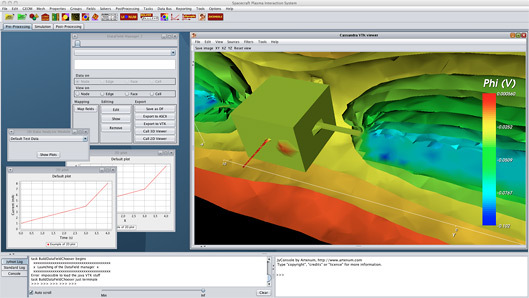 Keridwen, which originated in space technology, offers researchers and engineers a flexible and modular integrated environment for modelling and numerical simulation (IME) which enables an easy control of the whole modelling chain, from pre- to post-processing. Keridwen is also designed to integrate different computing cores, facilitating access to multi-physics and multi-model approaches. Mainly based on Java and relying on open-source proven technologies (VTK, Jython, Gmsh...), Keridwen is totally multi-platform. Fully operational, Keridwen is used on a large range of computers and OS, from a lightweight workstation to high performance clusters (HPC). Keridwen represents the evolution of the SPIS-UI framework, which was initially dedicated to the space environment and integrated into the open-source software suite SPIS (Spacecraft Plasma Interaction System) supported by ESA. As a generic and adaptable solution, Keridwen is currently opening its range of applications to numerous other areas, such as thermal analysis and fluid mechanics. Based on a modular object-oriented approach, Keridwen was conceived to be as generic as possible and the most versatile of its kind. It can be applied to a large range of models and a variety of physical domains; Keridwen provides a vast collection of pre-integrated tools, such as CAD and meshing tools, different data converters and analysis tools. Keridwen provides high capacity for post-processing and 2D/3D visualisation by using integrated tools such as Cassandra and Paraview, which are both based on VTK. In the modular approach, each component can be dynamically connected to the framework through standard plug-ins or Tasks. - An advanced control module called TaskManager facilitates the monitoring of the modelling process by non-experts and also the sequence of execution of the different steps of the process (Tasks). Its ability to dynamically compose these tasks makes Keridwen adaptable to numerous application scenarios. - A high-performance data bus or Scientific Services Bus (SSB) enables data conversion and exchange throughout the modelling chain. This includes the exchange of non-structured meshes and scientific data sets, using the JFreeMesh library. The originality of Keridwen is that it provides different levels of control via its GUI, passing from a high level graphics interface to subtle control of computation modules using a scripting language (Python/Jython). This approach is most convenient not only for the various needs of professional users, but also for for non-specialists in numerical simulation. Keridwen also enables the integration of existing native codes (C/C++, Fortran) providing an easy integration of your own computing software via different wrapping techniques. - numerous converters for scientific data formats. Lastly, each tool remains capable of being used individually, thus making Keridwen an open and extendable toolbox. Distributed under open source licence, Keridwen is a free software application maintained in a active community context. All the different components and relative licences are detailed here. As Keridwen profits from the dynamics of the SPINE group, the features are regularly updated. As well as this, many of its components, such as ArtTk, Cassandra and JFreeMesh receive regular contributions which come directly from industrial and scientific projects, including those of numerous clients and partners of Artenum. - support which extends from training to advice, and also on-demand development.